After spending three days on the Prince Edward Island (PEI), the Eastern most province of Canada, we decided to travel to the Bay of Fundy for Whale watching. The Bay of Fundy is a bay on the Atlantic coast between the Canadian provinces of New Brunswick and Nova Scotia. Some sources believe the name ‘Fundy’ is a corruption of the French word ‘Fendu’, meaning ‘split’, while others believe it comes from the Portuguese ‘funda’, meaning ‘deep’. The Bay of Fundy is known for having the highest tidal range in the world and is said to be best place to watch the whales in the summer. We had entered PEI through the Confederation Bridge and decided to take ferry for exiting the island. It could have been the resultant of my military mind which prompted the decision for a different exit route and also the eagerness for the experience of traveling by the ferry. The ferry commences its voyage from Wood Islands, PEI and takes 75 minutes crossing the Northumberland Strait to Caribou, Nova Scotia. The bottom two decks of the ferry holds about 150 vehicles, which include 60 feet trucks, cars and motor cycles. The upper two decks are for passengers and there is Wi-Fi, movies, restaurants, lounges, children play area, etc on board. 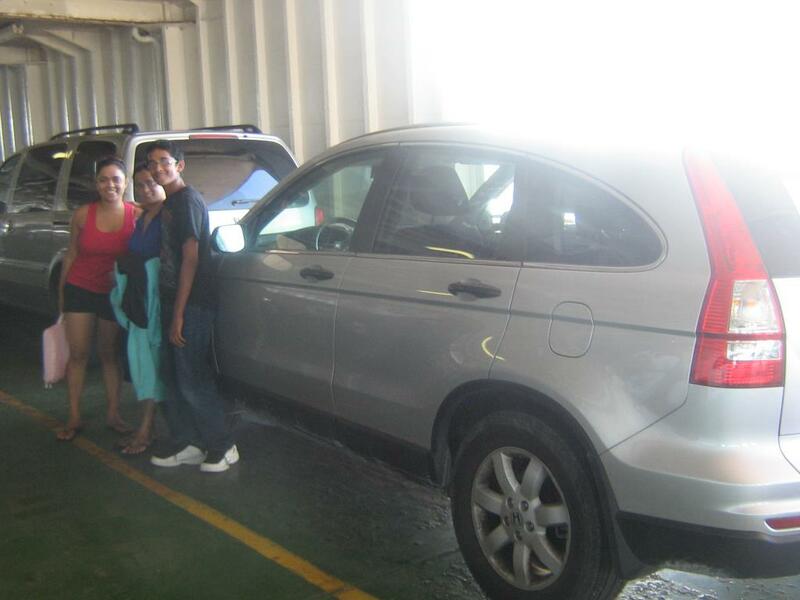 We loaded our car into the ferry at about 2 PM and moved into the upper deck to enjoy the sea breeze. We reached Caribou by around 3:30 PM and drove off to Middleton. 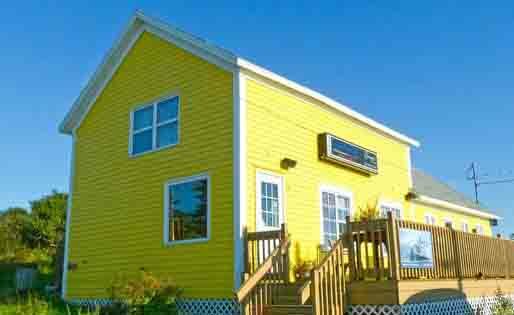 We spend the night in a motel at Middleton and the next morning drove to Freeport in Nova Scotia and reached an yellow building – the Lavena’s Catch Cafe which also houses the booking office for the Whale Watching Tour operated by Captain Tim. He also doubles up as a lobster fisherman, when he is not operating the Whale Watching Tour. On reaching the cafe, Nidhi our daughter was quick to come up with the fact that this place had featured in the Food Network’s series Pitchin’ In, hosted by chef Lynn Crawford. Lavena’s Catch Cafe established in 2000 is owned and operated by Tim Crockers’ sister Lavena and her husband Stanton. It is purely a family business and has been listed in Where To Eat In Canada since 2002. All dishes are prepared daily. The menu boasts of delicious seafood entree’s and fabulous homemade desserts. The menu is somewhat dictated by what comes off the boat that day and the seafood is as fresh as you can get. We had breakfast and placed our order for lunch, mainly scallop chowder, baked haddock and salads. 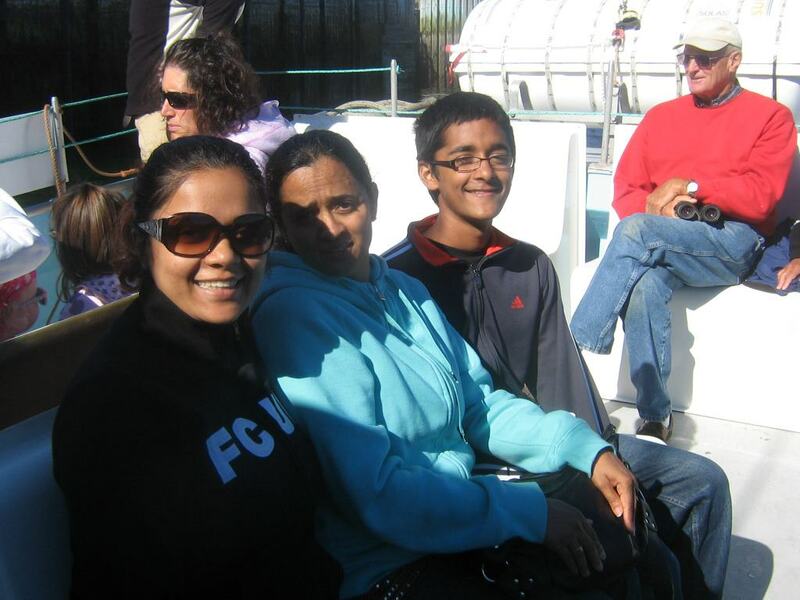 At 10 AM we embarked on Captain Tim’s boat for the Whale Watching Tour. After the mandatory safety briefing, the boat steamed off into the Bay of Fundy – a 90 minute cruise. Captain Tim kept briefing us about the seas, the whales and all his previous experiences of encounters with the whales. He claimed that he had never missed sighting the whales in any of his tours and promised us that we will all meet the biggest mammals. Suddenly the boat broke into high speed and Captain Tim called everyone to look in the front and there they were – about eight Humpback whales swimming majestically. Captain Tim positioned the boat about 30 meters from the swimming whales and moved parallel to them so that we could see the whales. These “showmen” put on some spectacular shows, literally throwing their bodies out of the water (breaching). They come into the Fundy Bay to feed on the enormous amount of capelin (small smelt fish) that come in from the sea. 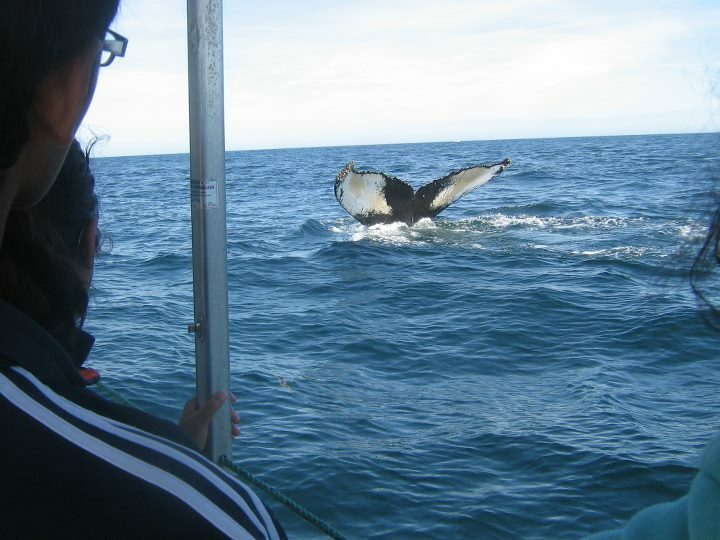 The humpbacks are about 12-16 metres long with black dorsal colouring and large white pectoral fins. Their top looks like a hump and hence their names and another distinctive feature of the Humpback are their fluked tail. Flukes are the two lobes of the whale tail. 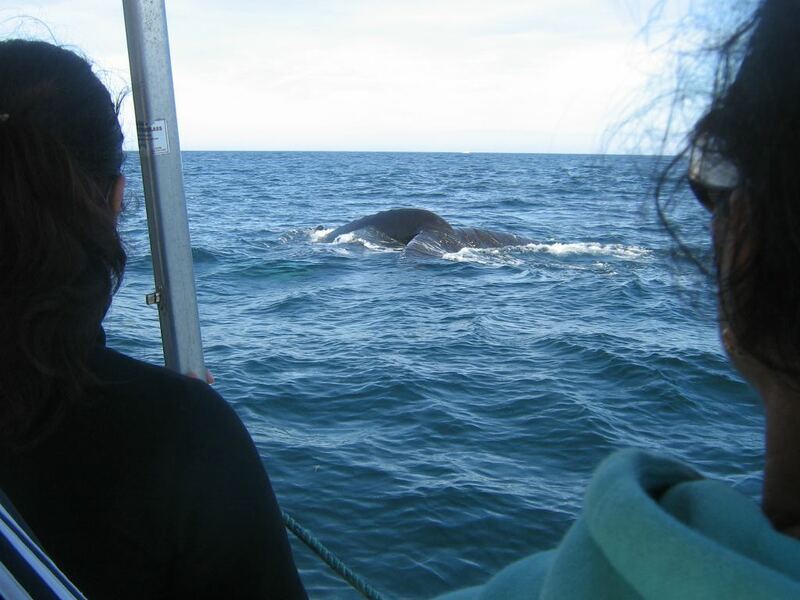 Whale watching tours follow the Marine Tour Operators Code of Ethics which include no chasing, harassing or herding the whales. This is to ensure that the whales are not disturbed from their natural routine or injured. On returning to the Lavena’s Catch Cafe by mid-day, hot chowders were waiting for us. We enjoyed the fabulous seafood lunch and set out to the Digby Port to catch the ferry to St Johns in New Brunswick. We loaded the car into the ferry and set sail at 4 PM for a three hour journey across the Bay of Fundy. The facilities in the ferry were similar to the earlier ferry and the duration being three hours, we decided to settle down in the lounge for a game of cards. After about two hours, the Captain announced that there were some killer whales sighted on the port side. We looked out and was about four killer whales emerging out of water, doing flips, turns and somersaults before landing back on the water. These killer whales are called Orcas and is a toothed whale, the largest of the Dolphin family. They are easily distinguished by their fin and their prominent black and white markings which can be seen from far. They are natural predators but as well, they are natural showmen. We disembarked at the St John’s port at about 7 PM and drove off to the hotel and spend the night there. Early morning we drove to Quebec City and the next day to our home in Mississauga. പോയിട്ടില്ല.. കുറിപ്പ് വായിച്ചപ്പോള്‍ അടുത്ത യാത്ര അങ്ങോട്ട്‌ പോയാലോ എന്നുണ്ട് 🙂 (Haven’t been there.. After reading this I feel our next trip should be to this place). Both of u are wonderful parents who take a lot of trouble to take ur children close to nature. I generally feel that people who have an innate fascination for mother nature, have some inherent goodness in them.